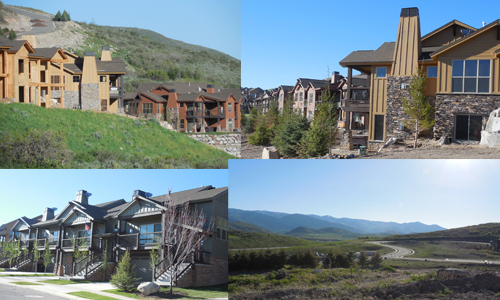 Black Rock Ridge is a development of condominiums and townhomes located just five minutes from Park City in Wasatch County. Construction began in 2007 and stalled during the recession. It restarted in 2012 and really gained momentum. It is now stable and selling quickly, well before the construction begins on a unit. There are 160 townhomes in the plan which range in size from 1984 square feet to 2293 square feet. Black Rock Ridge offers 4 models which have two to three bedrooms and 2 ½ to 3 ½ bedrooms. All of the floor plans have Main level master bedrooms and a two car garage. The finishes are excellent for the price point with stainless steel appliances, alder base and case, granite counter tops and high quality cabinet options. There are possible upgrades. Hot tubs, while not included, are allowed. Pets are allowed at Black Rock Ridge. The layout of this development was design with views of the ski areas in mind. When completed there will be 111 condos in the Black Rock Ridge development. These condos will be flats. There will be one to three bedroom units available that range in size from 843 square feet to 1442 square feet. All of these condos will come complete with a one car garage. Some of the garages will be attached others will be detached. All of the buildings will have elevators and comparable finishes to the Black Rock Ridge townhomes. The HOA fees for all of the condos and townhomes built at Black Rock Ridge currently include internet, telephone, basic cable, sewer, water, common area expenses, snow removal, landscaping, trash service and exterior maintenance.